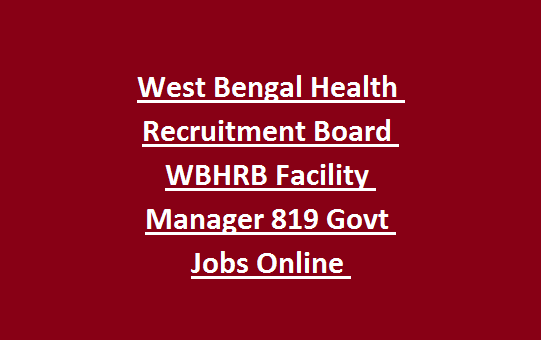 WBHRB recruitment 2019. Official website to apply online for this WBHRB recruitment is www.wbhrb.in. Online link for this WBHRB Facility Manager Posts will be active from 14-02-2019 to 28-02-2019. Candidates selection will be based on merit in qualifications or a preliminary exam will be conducted if large number of applications are received. Detailed recruitment process is given below for this WBHRB Facility Manager Posts Notification 2019. 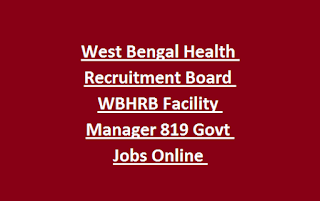 There are total 819 posts are in this WBHRB Facility Manager Recruitment 2019. As on 01-01-2019 upper age limit is 39 years. Degree qualification is required for this Facility Manager Jobs of WBHRB. Based on merit in qualifying exams candidates will be short listed. If applications are large number then a preliminary exam will be conducted for this WBHRB recruitment 2019. Apply online for this Facility Manager posts through official website of www.wbhrb.in. Online application from active dates are 14-02-2019 to 25-02-2019. Merit list or exam dates are updated in this website only whenever released.